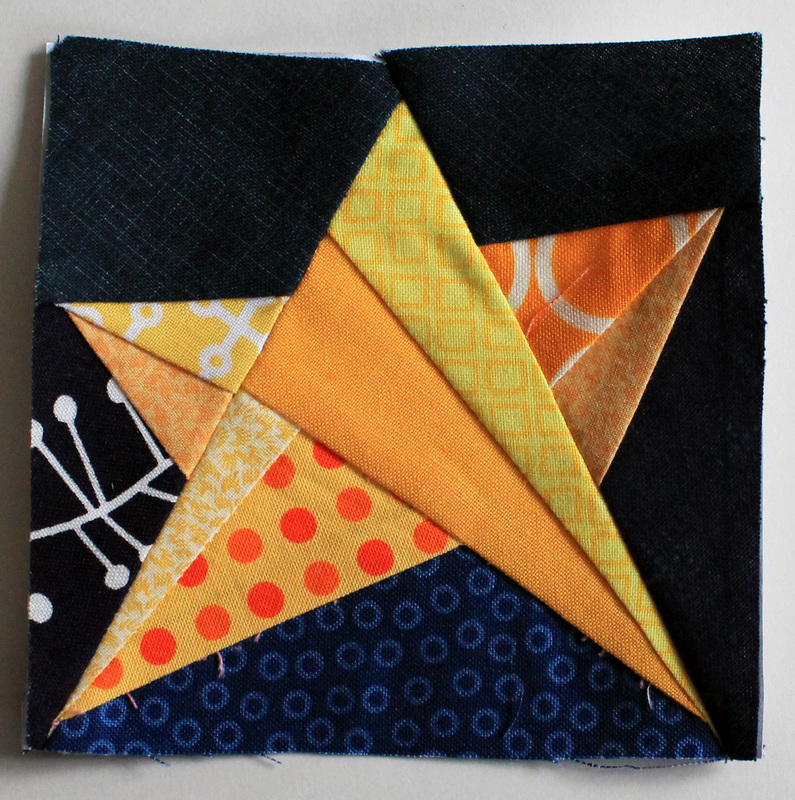 I struggled this week to find some paper pieced patterns that would give me small (think 4 inches) but interesting stars. My quilt definitely needs some size variety and I am not insane enough to shrink down one of the more complex patterns to a tiny size…even I have limits. After a little bit of searching I found a version of this star…. The original pattern is from A Little Bit of Biased’s Paper Piecing Tutorial. I adapted the pattern a little to add a bit more complexity and ended up with this.. The shape of this star is so different from my other stars and it has a lovely wonky feel. As the block was so simple, I of course had to make two. What a difference from last week…my complex 100 piece snowflake is followed by a simple 13 piece tiny star. What will next week bring? So pretty! I really want to try some of these next year. I would suggest going a little larger than 4 inches. It was a little messy working this small with this pattern. I’m waiting impatiently to see the start of the layout. Smaller stars are a great idea, it’ll help to bring movement to the arrangement, and they are wonderfully individual and wonky! In another couple of weeks I will start playing with the layout again. I need some more stars to really see how it is going…plus my puddly little design wall is full at the moment. Soon I promise Kate. I keep visualising a 400-piece comet with a long flowing tail… But I’ll shut up now, it’s your quilt! Oooh how cute! Love this little faceted star. So pretty! 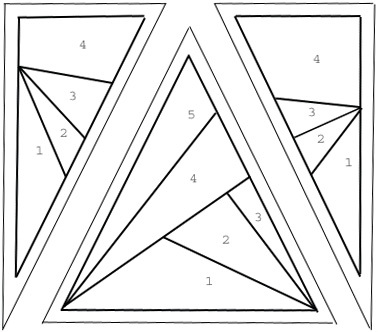 I may need to give this a try for my starry Christmas quilt, if i ever find the time to get back to it! I absolutely love a small block!!! Great choice!!! 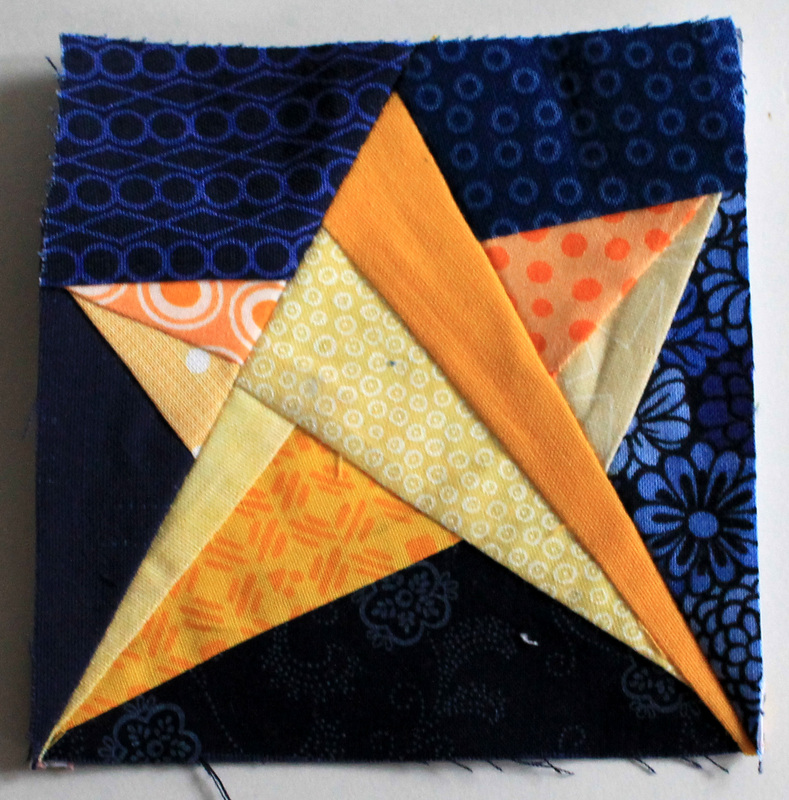 I love small blocks too….they certainly add variety. Looking forward to seeing how it all comes together.